Publication of the book coordinated by Rafael Domínguez, Giuseppe Lo Brutto and Javier Surasky. Southern constellation: Historical-Critical readings of South-South Cooperation. Editors: Rafael Domínguez Martín, Giuseppe Lo Brutto and Javier Surasky RIACI. ICSyH/BUAP and Universidad de Cantabria, Spain, editores. Will be published in December 2018. PhDs. Rafael Domínguez, Giuseppe Lo Brutto, Ada Cabrera and Mg. Eduardo Crivelli participate. Publication of the book coordinated by Javier Vadell “A expansão econômica e geopolítica da China no século XXI: diferentes dimensões de um mesmo processo”, Javier Vadell (ed); editado por la PUC MINAS, Belo Horizonte, Brasil. Will be published in June 2018. PhD Rafael Domínguez Martin and PhD Giuseppe Lo Brutto participate. ​Coordination of the work table in the congress FLACSO-ISA July 2018, Quito, Ecuador. Phds. Ada Cabrera, Javier Vadell y Giuseppe Lo Brutto participate in this event. ​Participation in IV International Congress of Development Studies REEDES, December 12-14, 2018, Universidad de Loyola, Cordoba, Spain. All seven members of this group participate in this event. 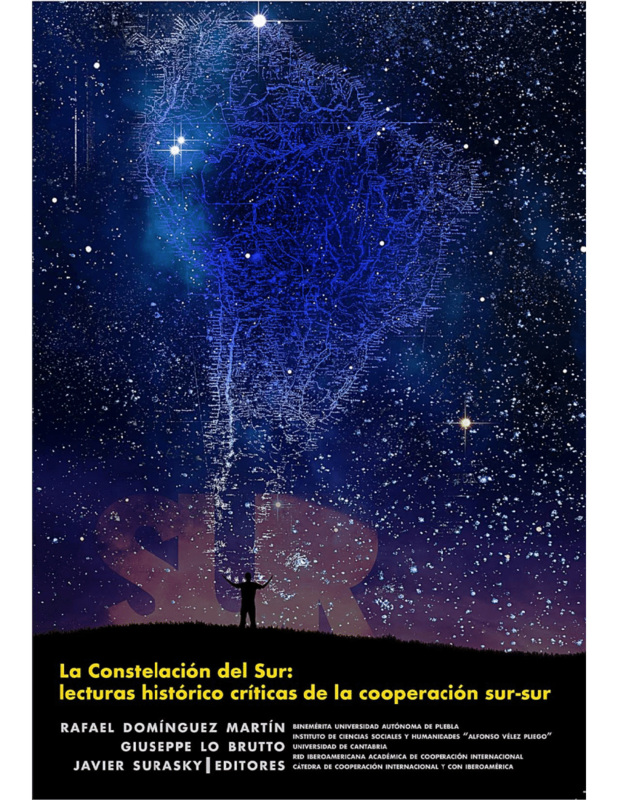 Publication of the book The Constellation of the South: historical-critical readings of South-South Cooperation, coordinated by Rafael Domínguez, Giuseppe Lo Brutto and Javier Surazky, edited by the Universidad de Cantabria, Spain, and the Instituto de Ciencias Sociales y Humanidades "Alfonso Vélez Pliego " of the Benemérita Universidad Autónoma de Puebla, Mexico. Participation in III International discussion “International migrations in XXI century: “an analysis from Latin America”, May, 2019 at Universidad San Buenaventura, Cartagena de Indias, Colombia. Participation in IV International Meeting of research group in South-South Cooperation and Regional Integrations (G.I. CSS-REEDES), at Università della Calabria (UNICAL), Rende (Cosenza), Italy from june 20 to 22, 2019. Participation in I Meeting-International Seminar: "Past and present of international cooperation: a critical perspectivefrom the theories of World-System" at Università della Calabria (UNICAL), DISPES, in Rende, Cosenza (Italy) from June 20 to 22, 2019. Publication of the book Migrations in the 21st Century: A Critical Analysis from Latin America, coordinated by Gustavo Rodríguez, Ibelis Blanco and Ada Cabrera, published by the Universidad San Buenaventura, Cartagena de Indias and the Universidad Autónoma del Caribe, Colombia, and the Instituto de Ciencias Sociales y Humanidades "Alfonso Vélez Pliego " of the Benemérita Universidad Autónoma de Puebla, Mexico. Publication of the monograph at Cambridge Review of International AffairsThe International plitical economy of China-Global South relations: dubts, uncertaines and expectations for 21st century Coordinated by Javier Vadell and Giuseppe Lo Brutto. Publication of the thematic Dossier, CRH-UFBA Notebook A international political economy of China-Latin America and Caribbean relations: dúvidas uncertainty and expectations for the 21st century (Organizers Javier Vadell and Giuseppe Lo Brutto). Publication of a monograph result of the II Encounter of the Inter-academic Research Group on International Cooperation and of the I Encounter-International Seminar: "Past and present of international cooperation: a critical perspective from the theories of World-System" coordinated by Giuseppe Lo Brutto and Isabella Giunta. Publication of the IV Book RIACI Debates. Publication of a monograph result of the II Encounter of the Inter-academic Research Group on International Cooperation. Dissemination of newsletters, publication of indexed and disseminated articles, participation in the publication of books and book chapters, as well as participation in national and international calls. Direction and accompaniment in various Tutorial Committees of Degree and Postgraduate Theses of the Benemérita Universidad Autónoma de Puebla (BUAP), Mexico, the Instituto de Altos Estudios Nacionales (IAEN), Ecuador, the Universitá della Calabria (UNICAL), Italy, the Universidad de Cantabria (UNICAN), Spain, the Universidad Autónoma del Caribe (UAC), Colombia and the Universidad Pontificia Universidad Católica de Minas Gerais (PUC-MG), Brasil. Participation and teaching of academic graduates of extracurricular training, face-to-face like the "Diploma of Critical Studies on the World Economy", given at the Centro de Estudios del Desarrollo of the Economics Faculty of the Benemérita Universidad Autónoma de Puebla, México; and online like the "Massive online open Course (MOOC): Introduction to Development Studies: methods and instruments" of REEDES in collaboration with the Universidad de Cantabria, Spain. Academic link with the social sector, with Reed Española de Estudios del Desarrollo (REEDES), the Red Iberoamericana de Cooperación Internacional (RIACI), the Red Mexicana en Cooperación Internacional y Desarrollo (REMECID), the Red Académica de América Latina y el Caribe sobre China (Red ALC-China), the Catedra de Cooperación Internacional y con Iberoamérica (COIBA), the Grupo de Investigación en Desarrollo Humano y Cooperación Internacional de la Universidad de Cantabria, the Cuerpo Académico BUAP CA 165 “Sociología Política y del Desarrollo” and BUAP CA 130 “Análisis Económico” of the Benemérita Universidad Autónoma de Puebla (BUAP), México. In addition, all these actions include the close link in teaching research and exchange between the Instituto de Altos Estudios Nacionales (IAEN), Ecuador, the Universitá della Calabria (UNICAL), Italy, the Universidad de Cantabria (UNICAN), Spain, the Universidad Autónoma del Caribe (UAC), Colombia, the Universidad San Buenaventura, Cartagena de Indias, Colombia, the Instituto de Ciencias Sociales y Humanidades “Alfonso Vélez Pliego” of the Benemérita Universidad Autónoma de Puebla, México and the Universidad Pontificia Universidad Católica de Minas Gerais (PUC-MG), Brasil. These activities are also part of the actions of the Research Group on South-South Cooperation and regional integrations of the Spanish Reed of Development Studies (GICSS-REEEDES) https://reedes.org/gi-cooperacion-sur-sur-gi-css/. The international academic research group described below was created at the beginning of 2015 within the framework of the Red Española de Estudios del Desarrollo (REEDES). The group is made up of three researchers from the Posgrado en Sociología/Instituto de Ciencias Sociales y Humanidades “Alfonso Vélez Pliego” (ICSyH) in the Benemérita Universidad Autónoma de Puebla (BUAP). It is composed of PhD. Giuseppe Lo Brutto; from the Facultad de Economía, PhD. Ada Celsa Cabrera García; and, from Facultad de Derecho y Ciencias Sociales -Licenciatura en Relaciones Internacionales-, Mg. Eduardo Crivelli Minutti. From left to right: PhD. Ada Cabrera, Giuseppe Lo Brutto and Mg. Eduardo Crivelli. This group also collaborates in a permanent way with other professors from Ibero-American universities, such as: PhD. Rafael Domínguez Martin, Catedra de Cooperación Internacional con Iberoamérica (COIBA), from the Universidad de Cantabria (Spain) PhD. Gustavo Rodríguez Albor, Universidad del Norte (Colombia) and Escuela Latinoamericana de Cooperación Internacional (Colombia) PhD. Javier Vadell, Pontificia Universidad Católica de Minas Gerais, Belo Horizonte (Brasil) and, finally, PhD. Sara Caria, Escuela de Altos Estudios Nacionales (Ecuador). From left to right: PhD. Sara Caria; PhD. Giuseppe Lo Brutto; PhD. Gustavo Rodríguez Albor; PhD. Javier Vadell Campagnucci; PhD. Rafael Domínguez Martín; Mg. Eduardo Crivelli Minutti. Giuseppe Lo Brutto holds a PhD in political economy of development from Benemérita Universidad Autónoma de Puebla (BUAP), has a master’s degree in Economic Development and International Cooperation (Universidad de Murcia, España), and received his undergraudate degrees in Italy (Universitá degliStudi di Milano, Laurea specialistica in Relazioni Internazionali e Diplomatiche; y Universitá degli Studi di Palermo, Laurea in Relazioni Internazionali). Giuseppe is Coordinator of the South-South Cooperation and regional integrations Research Group of the Red Española de Estudios del Desarrollo (GICSS-REEDES). Ada Celsa Cabrera García Ph.D.
Ada is a full time Associate Professor in Facultad de Economia at BUAP, in the area of historical thought for the bachellor’s degree in economics, and International Cooperation for development in the master’s degree program. She is a member of the Sistema Nacional de Investigadores (SNI), level I, CONACyT, Mexico. She is also a member of the registry of BUAP researchers, and a collaborator in groups on economic analysis, BUAP-CA 130. She has recently applied to be part of the PRODEP program “Nuevo PTC”. Ada is a member of the South-South Cooperation and regional integrations Research Group of the Red Española de Estudios del Desarrollo (GICSS-REEDES). He is author of articles and chapters of a book on topics of International Migration and International Cooperation for Development. Eduardo is Secretary of the Coordination of the South-South Cooperation and regional integrations Research Group of the Red Española de Estudios del Desarrollo (GICSS-REEDES). He is also a member of the Red Académica de América Latina y el Caribesobre China (RED ALC-CHINA) the Asociación Mexicana de Estudios Internacionales (AMEI), and the Asociación Mexicana de Ciencias Políticas (AMECIP). He has participated in several International congresses and seminars that address these issues. Since 2014, Eduardo has been an assistant researcher to PhD. Giuseppe Lo Brutto. Since 2017, he has worked as an undergraduate Professor of International Relations in the Faculty of Law and Social Sciencies of the BUAP, and since 2018, he’s been a Professor of the Master’s Degree program in International Relations and Human Rights, Facultad de Derechos y Ciencias Sociales, BUAP. Gustavo Jesús Rodríguez Albor Ph.D.
Gustavo Jesús Rodríguez Albor received his PhD in Social Sciencies (Universidad del Norte, Colombia). He is specialist in applied satistics (Universidad del Norte, Colombia), and an economics (Universidad del Atlántico Colombia). Gustavo is an expert in data analysis of statistical software, such as SPSS and STATA and a research professor in the Universidad Autónoma del Caribe (Colombia) and the Universidad del Norte (Colombia), in International Cooperation Migrations and Development. Gustavo is currently the coordinator of the Red Iberoamericana Académica de Cooperación Internacional (RIACI), and has experience in research and consulting. With a PhD in economic history from Universidad de Cantabria (UC), Rafael is a tenured professor in the UC department of economics and a specialist in corporate social responsibility at Universidad de Buenos Aires. Since 2006, he has been the director of of the COIBA chair and of the Master’s degree program of Ibero-American International Cooperation and Development. Since 2011, he’s directed the Grupo de investigación en Desarrollo Humano y Cooperación Internacional de la UC, and since 2015 he has coordinated the research group in South-south cooperation and Regional Integrations of the Red Española de Estudios de Desarrollo (REEDES). He is also a functional member of the great Caribbean Economic research network, based in the Universidad del Norte (Barranquilla, Colombia), and he is a member of the Latin American society of political economy and critical thinking. Javier is a graduate in International Relations from Universidad Nacional de Rosario (1989), and Ciência Política pela Universidade Estadual de Campinas (1997), and holds a PhD in Social Sciences form Universidade Estadual de Campinas (2002). He is currently a professor at the Pontifícia Universidade Católica de Minas Gerais. Javier serves as a visiting professor from the Universidad Nacional de Rosario (UNR), Argentina. He’s a permanent professor form the Programa de Relações Internacionais da Universidade Estadual da Paraíba (UEPB), the editor of Estudos Internacionais, international relations review from PUC Minas, and the Lider ot Grupo de Pesquisa das Potências Médias. Javier is a Bolsista de Produtividade em Pesquisa no CNPq, level 2, a member of the Conselho Científico do Instituto de Estudos da Ásia, the Red de Integración de América Latina y el Caribe (REDIALC), the Grupo de Investigación en Cooperación Sur-Sur e Integración Regional de la Red Española de Estudios del Desarrollo,as well as the GRIDALE - Grupo de reflexión sobre Integración y Desarrollo en América Latina y Europa. Sara possesses a PhD in Social Sciencies from the Universidad de Salamanca, Spain. She has a master’s degree in cooperation and development from the Università degli Studi di Pavia, Italy, and a becholor’s in international and diplomatic sciencies from the Università degli Studi di Trieste, Italia. She is a member of the South-South cooperation research group of the Red Española de Estudios del Desarrollo (REEDES), and has participated as a speaker in several international events. Sara is currently a research professor at the Centro de Economía y Sectores Estratégicos en el Instituto de Altos Estudios Nacionales, (IAEN), in Ecuador. From left to right: PhD. Giuseppe Lo Brutto; PhD. Sara Caria; PhD. Rafael Domínguez Martín; PhD. Ada Caberara García; PhD. Isabella Giunta; Mg. Eduardo Crivelli Minutti at the IIIInternational Meeting of research group in South-South Cooperation and Regional Integrations (G.I. CSS-REEDES), in Cordoba, Spain. Rogelio Regalado Mujica; Jose Raymundo Ibañez Luis and Carlos Otto Vázquez Salazar (Postgraduate in sociology from ICSyH/BUAP). Cruz Humberto González Gutierrez and Aldo Domínguez Contreras (master’s Degree in Economic Development and International Cooperation from CEDES/BUAP). International Seminar "Los contratiempos de la Izquierda Progresista”, 09/2017. Research stay of PhD. Domínguez Martín, 09/2016. International Seminar “Escenarios eactuals de los Gobiernos Progresistas en América Latina. ¿Fin del Ciclo?”, 11/ 2016. All of the collaborators are grouped into different networks, research teams and university chair positions, working over the last few years on academic research in an international field. The group has been working to build a historical and critical perspective on the study of globally interwoven economic policies, political processes, and social issues. These researchers are focused on matters like international cooperation, South-South international migration, development, globalization, and geopolitics with an emphasis on Latin America. Erasmus + “Enter Digital Era”, financed by European Commission. PhDs. Giuseppe Lo Brutto and Ada Celsa Cabrera García as representatives of BUAP. The duration of the project is two years and it will include the participation of ten partners from Asia, Europe and Latin American. ERASMUS PLUS “Social Processes Empovering Entrepreneurship Development” and “Migration, Inclusion and Integration” financed by the European Commission. I International Meeting of the research group in South-South Cooperation and Regional Integrations, (G.I. CSS-REEDES), May 2015, Universidad de Cantabria, Cátedra de Cooperación Internacional con Iberoamerica, Santander, Spain. PhD: Rafael Domínguez Martín, Gustavo Rodríguez Albor, Giuseppe Lo Brutto participated. II International Meeting of the research group in South-South Cooperation and Regional Integrations, Zaragoza, Spain, (G.I. CSS-REEDES), June 30 2016 in the framework of the III REEDES international congress. PhD. : Rafael Domínguez Martín, Gustavo Rodríguez Albor, Javier Vadell, Giuseppe Lo Brutto participated. III International Meeting of research group in South-South Cooperation and Regional Integrations (G.I. CSS-REEDES), Instituto de Ciencias Sociales y Humanidades “Alfonso Vélez Pliego”, Benemérita Universidad Autónoma de Puebla, September, 11, 12 and 13 2017. PhD. 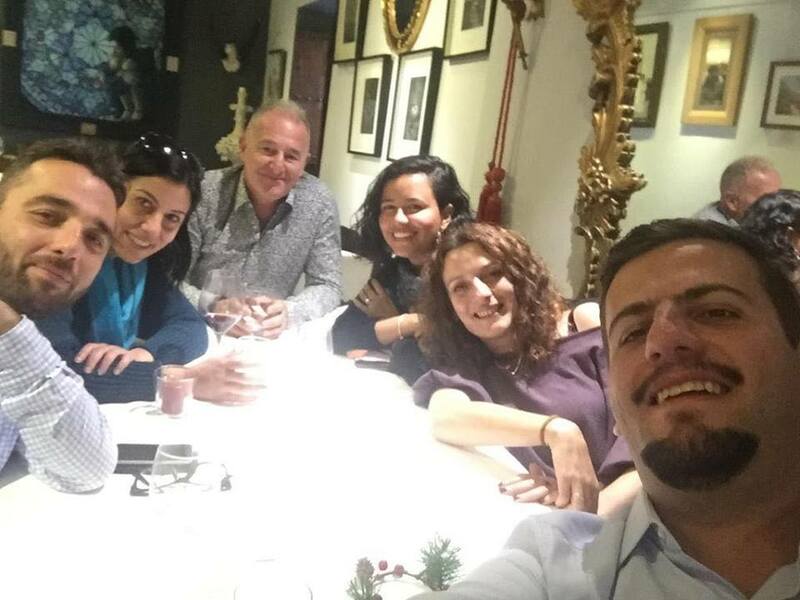 : Javier Vadell, Rafael Domínguez Martín, Gustavo Rodríguez Albor, Giuseppe Lo Brutto, Ada Cabrera, Sara Caria and Mg. Eduardo Crivelli Minutti participated. III International Seminar on Middle Powers, PUC MINAS, Belo Horizonte, Brazil, August 25 and 26, 2016. PhD. Giuseppe Lo Brutto and. Javier Vadell participated. International Seminar: Countermeasures of the progressive left and the rise of the right in Southern Europe and Latin America, September 4-8, 2017, Instituto de Ciencias Sociales y Humanidades/BUAP, with the organization and participation of BUAP-CA 195 Sociología Politica y del Desarrollo. PhDs. Rafael Domínguez Martín, Ada Cabrera, Giuseppe Lo Brutto and Mg. Eduardo Crivelli Minutti participated. Events made during the stay (due to the call for International Relations of BUAP for Professors with high profiles) of PhD. Rafael Domínguez Martín visiting professor in the activities of BUAP- CA 195 Sociología Política y del Desrrollo, Posgrado en Sociología, Instituto de Ciencias Sociales y Humanidades/BUAP on November 7 and 8, 2016. PhDs. Giuseppe Lo Brutto, Ada Cabrera and Mg. Eduardo Crivelli participated. International Seminar. “Current realities of progressive governments in Latin American”. End of the Cycle?, Organized by BUAP-CA 195 Sociología Política y del Desarrollo del Posgrado en Sociología, ICSyH/BUAP on November 7 and 8, 2016. PhDs. Rafael Domínguez Martín, Ada Cabrera, Giuseppe Lo Brutto and Mg. Eduardo Crivelli Minutti participated. III REEDES International Congress, What development do we want? Zaragoza, Spain, June 29 and 30 and July 1, 2016. PhDs. : Rafael Domínguez, Gustavo Rodríguez Albor, Javier Vadell and Giuseppe Lo Brutto participated. IV REEDES International Congress, Universidad de Loyola, Cordoba, Spain, December 12-14, 2018. PhDs. Javier Vadell, Rafael Domínguez Martín, Gustavo Rodríguez Albor, Giuseppe Lo Brutto, Ada Cabrera, Sara Caria and Mg. Mg. Eduardo Crivelli Minutti participated. International discussion “International migrations in XXI century: “an analysis from Latin America”, April, 26, 2018 ICSyH/BUAP. ICSyH/ BUAP. PhDs: Giuseppe Lo Brutto, Ada Cabrera, Gustavo Rodríguez and Mg. Eduardo Crivelli participated. III International discussion “International migrations in XXI century: “an analysis from Latin America”, May, 2019 at Universidad San Buenaventura, Cartagena de Indias, Colombia. IV International Meeting of research group in South-South Cooperation and Regional Integrations (G.I. CSS-REEDES), at Università della Calabria (UNICAL), Rende (Cosenza), Italy from june 20 to 22, 2019. I Meeting-International Seminar: "Past and present of international cooperation: a critical perspectivefrom the theories of World-System" at Università della Calabria (UNICAL), DISPES, in Rende, Cosenza (Italy) from June 20 to 22, 2019. Event on International Cooperation at Universidad de San Buenaventura, Cartagena de Indias, Colombia from August 26 to 30, 2019. V International Meeting of research group in South-South Cooperation and Regional Integrations (G.I. CSS-REEDES), Universidad del País Vasco, Bilbao, Spain, 2020. IV International discussion “International migrations in XXI century: “an analysis from Latin America”, May, 2020 at Universidad San Buenaventura, Cartagena de Indias, Colombia. II Meeting-International Seminar: "Past and present of international cooperation: a critical perspectivefrom the theories of World-System", 2020. VI International Meeting of research group in South-South Cooperation and Regional Integrations (G.I. CSS-REEDES), 202I. IV International discussion “International migrations in XXI century: “an analysis from Latin America”, May, 2021 at Universidad San Buenaventura, Cartagena de Indias, Colombia. II Meeting-International Seminar: "Past and present of international cooperation: a critical perspectivefrom the theories of World-System", 2021. Book presentation “History of International Cooperation from a critical perspective”. From left to right: PhD. Giuseppe Lo Brutto; PhD. Rafael Domínguez Martín; PhD. Gustavo Rodriguez Albor. From left to right: PhD. Ada Cabrera, Beatriz Martinez, Gloria Marroni, Giuseppe Lo Brutto, Mg. Eduardo Crivelli, Blanca Cordero y Gustavo Rodríguez. September 2016: Stays of PhD Rafael Domínguez in the Posgrado en Sociología, ICSyH/BUAP with PhDs Giuseppe Lo Brutto, Ada Cabrera and Mg Eduardo Crivelli Minutti. April 2017: Internship of PhD. Giuseppe Lo Brutto at the cathedra COIBA of Universidad de Cantabria, Santander, Spain. Directed by PhD. Rafael Domínguez Martín. April 2018: Internship of PhD. Gustavo Rodriguez Albor in the ICSyH/BUAP with the participation of PhD. Ada Cabrera and Mg. Eduardo Crivelli Minutti. Red Española de Estudios del Desarrollo (REEDES). Red Iberoamericana Academica de Cooperation Internacional (RIACI). Coordinated by Dr. Gustavo Rodríguez Albor. Red Mexicana de Cooperacion Internacional y Desarrollo (REMEXCID). Research group “Desarrollo Humano y Cooperación Internacional” (International Cooperation with Iberoamerican Cathedra, COIBA), Cantabria University, Spain. Coordinated by PhD. Domínguez Martín. General Agreement of Collaborative Work of International Networks and Research Groups of Development (GINEDES), participate different Ibero-American universities. Research Group about Middle Powers, PUC Minas, Belo Horizonte, Brazil. Coordinated by PhD. Javier Vadell. Investigation Group on REEDES about South-South Cooperation and Regional Integrations. Coordinated by PhDs. Rafael Domínguez Martin and Giuseppe Lo Brutto. Catedra de Cooperacion Internacional con Iberoamerica (COIBA) from Universidad de Cantabria (Spain). Coordinated by PhD. Rafael Domínguez Martín. Monographic: “Realities and contemporary perspectives in south-south cooperation and integration processes in Latin America, facing the change of the regional political cycle”, (2017), Research Group in South-South Cooperation and Regionals Integrations/REEDES. Coordinated by: Rafael DOMÍNGUEZ-MARTÍN and Giuseppe LO-BRUTTO, Relacoes Internacionais, Estudos Interncionais Journal, PUC MINAS, Brazil. Monographic: “South-South Cooperation and Integration Processes”, (2016), REEDE’S Research Group on South-South Cooperation and Regionals Integrations. Coordinated by: Rafael DOMÍNGUEZ-MARTÍN and Giuseppe LO-BRUTTO, /January-June, 2016 /Volume 5, /Issue 1, ISSN: 2254-20355, Ibero American Journal of Development Studies. 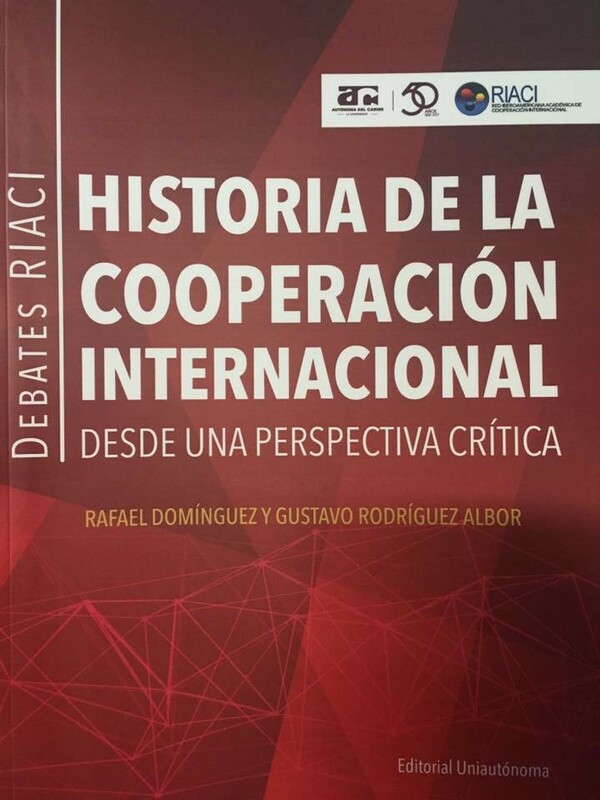 Book: “History of International Cooperation from a critical perspective”, (Albor, G., & Domínguez, R., coordinators), Editor RIACI, Colombia, ISBN: 978-958-5431-08-9. 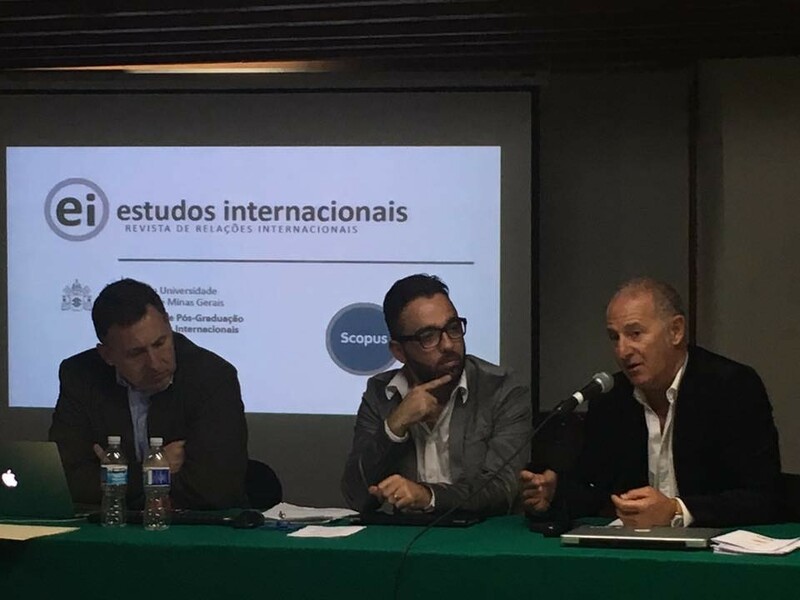 Presentation of Dossier “Realities and contemporary perspectives in south-south cooperation and integration processes in Latin America, facing the change of the regional political cycle”, Relacoes Internacionais, Estudos Interncionais Journal, PUC MINAS, Brazil. From left to right: PhD. Javier Vadell Compagnucci; PhD. Giuseppe Lo Brutto; PhD. Rafael Domínguez Martín. Call for International Relations of BUAP. For Stays of foreign professors with High profiles, which sent PhD. Rafael Domínguez Martin to participate in the activities of the BUAP- CA 195 Sociology Policy and Development on September 2016. ​Call of the alliance of the pacific to realice a stay of investigation with PhD Giuseppe Lo Brutto on October and November 2018 by part of PhD Gustavo Rodriguez Albor, Universidad del Norte (Colombia). ​CLACSO call 2016 for the recreation of a work group. 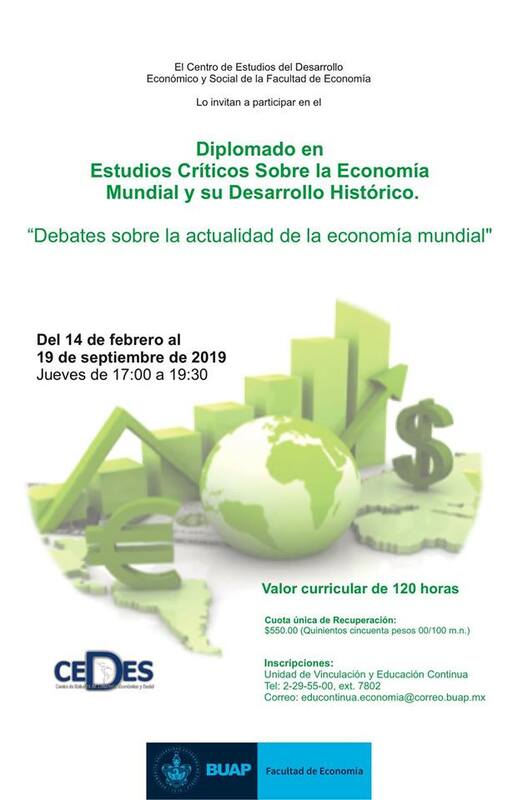 Bachelor program in “Estudios Críticos de la Economía Mundial y su Desarrollo Histórico” has been offered over the past two years at the Facultad de Economia, BUAP. Coordinated by PhD. Ada Cabrera in all four terms (2016, 2017, 2018 and 2019). In the last year, PhD. Giuseppe Lo Brutto collaborated in its implementation. The collaboration of Mg. Eduardo Crivelli is also noted during the second term.